I've been blogging for almost five years now. It's been an emotional ride; I've had many ups and a few downs, but I wouldn't change a single moment. I've learnt a lot of hard lessons, and it's taken me a long time to get where I am. A few times I've thought about quitting my blog, but I have never given up. So for those of you who are considering quitting - or considering beginning a blog but just aren't sure - this post is all about the five things that blogging has taught me over the years. I started blogging as a hobby to help with my depression. Almost five years on, I'm happy to say that I rarely struggle with my depression anymore, and I feel like blogging is a huge part of this. Slowly over time, I became more comfortable with telling people about my blog, and more comfortable about openly celebrating my achievements. I feel like blogging has given me the confidence to be happy with myself, and not put so much emphasis on what other people think of me. Whilst I do get the anonymous hate comment, blogging has helped me grow a thick skin and learn to move on. Before the internet, opinions were rarely shared with large groups of people. Being a blogger, I feel like my life is an open book. My opinions and my preferences are out there for all to see and judge. I write my blog for me more than anybody else, but I also strive to be a role model in my field. I'm now more wary about what I say online, and in real life, and this has helped me to be more open minded. Think before you judge is a mantra I practice every day. When I first started my blog, I wanted it to be perfect. I wanted to be exactly like all the famous bloggers already on the internet and I wanted to have a million followers right away. That first year of blogging taught me some harsh lessons about expectations, and I soon learnt that it is impossible to be perfect in the eyes of the internet. 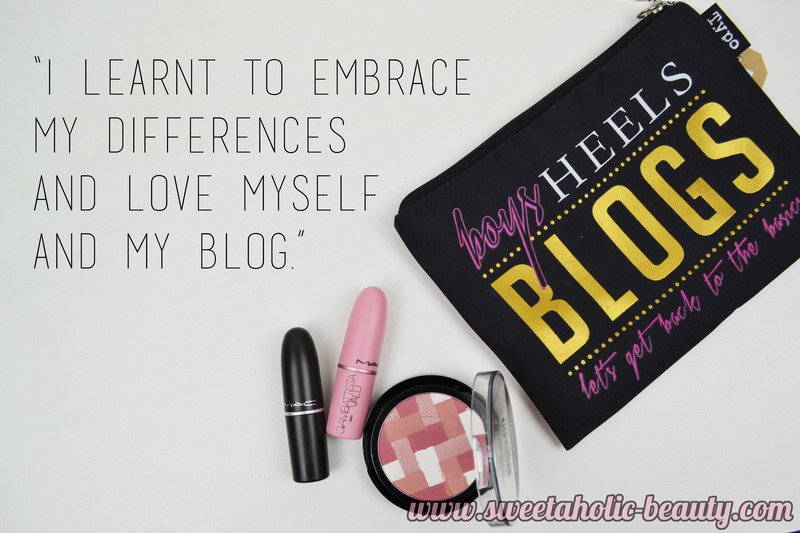 I learnt to embrace my differences and love myself and my blog. One of the greatest discoveries, one that I was not expecting from the blogging world, was the community. I have met some absolutely amazing people through blogging, and I will be their friends even if I stopped blogging. After starting Bloggers United AU, a community based organisation, with blogger Nikita (who is amazing and a huge inspiration, by the way) I have really seen the power of community. Unfortunately I have also met some horrible people too, but I will never let those kinds of people get me down. I may have wanted to quit blogging a few times; twice to be exact. Once when I first started and was struggling with making friends, and a second time when my partner was incredibly ill and another blogger was making my online life particularly difficult. Both times I powered through and reminded myself that blogging is something I love and something I have always wanted to do. If I had given up, I know I would have regretted it. I have worked hard on my blog, spend so many hours working on content and photography, and I have made so much progress. 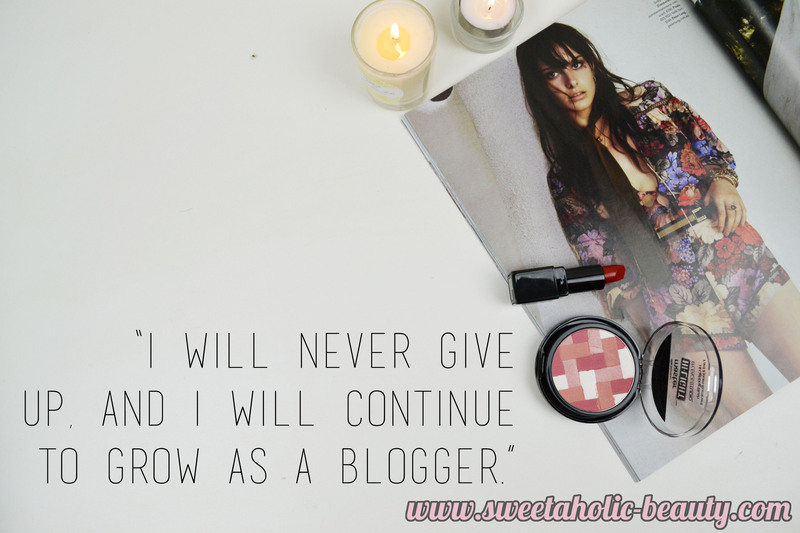 I will never give up, and I will continue to grow as a blogger. Blogging is my passion. I love blogging, and I love the community based around blogging. I know that as a blogger I will grow and I'll never stop learning or meeting new and inspiring people. I am appreciative every day to have met the people I have met, and to have worked with so many wonderful brands and people. 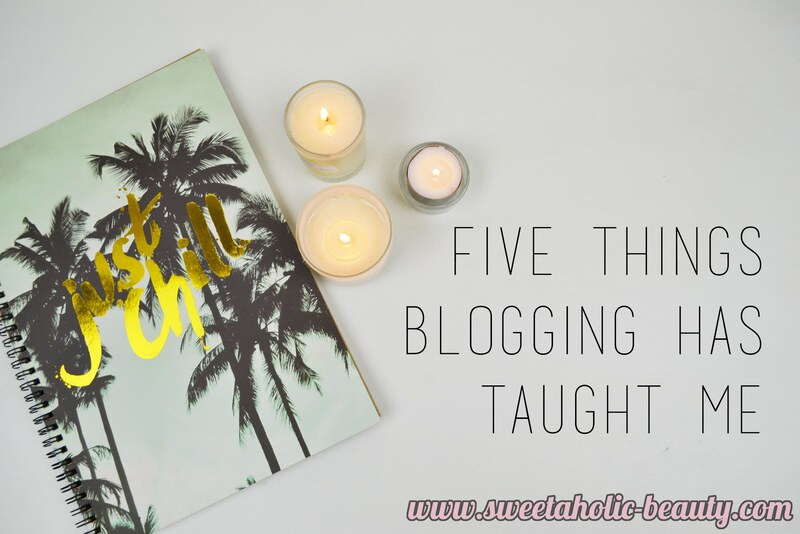 These are just five very important lessons I have learnt through blogging. I feel that they have made me a stronger person both online and offline. I have a million more lessons I have learnt, and I'll keep learning more lessons as I go, but I felt like these are incredibly important and I really wanted to share. What important lessons has blogging taught you? Have you ever felt the urge to quit blogging - or begin a blog, if you don't already have one? Right on, sister! And I think at the very core of it, saying that you're doing this for yourself, that's really the message you need to hold on to - running your blog to make yourself happy, that's what's important! And look at everything you've achieved! There's always going to be some negativity wherever you go, but you are amazing, and you serve as inspiration for others. I started my blog as an outlet for wanting to talk about beauty, and it's improved over the years, which I'm quite proud of, as I actually am completely NOT artistic. This means that the pictures are hard work for me, and actually seeing things blossom (ie pictures go form blah to better) - that's amazing for me. I'm always striving to improve it, so here's to more years of beauty from you and from me! P.S. Sorry - got carried away and it's now an essay! You are amazing chick! Blogging has taught me so much too and has allowed me to met so many beautiful people that I now consider friends. It's been such a great ride with Bloggers United AU and I couldn't have picked someone better who is very like minded in the way we view things from the community and what we value through our blogs. What a great post Jasmine! I really love all of these and agree that blogging definitely has it's ups and downs, and one of those things that you definitely have to have a genuine passion for, because it takes a lot of effort, even when our lives get very hectic and chaotic. I really love all of the people I have met in person and online through blogging and I hope to keep on blogging as mine is also a creative outlet for me and keeps me sane some days! You are doing such a good job Jasmine! It's hard writing a blog and running something like BU Aus with the meetups and swaps. You should be very proud of yourself! Like Leah said, there will be negative Nancys everywhere and at least, online you can delete them out of your life. It's harder when it's in person or you're working with them lol. Sometimes I just can't be bothered to blog like nothing was exciting me at the time so I don't force myself to do it but it's always on the back of my mind. Thanks so much Kat! There is a lot on my plate but I like it that way haha. And yes very true about those negative Nancys, they are just online so it does make it easier to deal with. Aw thank you Sarah! It definitely does take a lot of effort and I think a lot of people who don't blog don't actually realise haha, but at the end of the day it really is all worth it. Leah you are such a gorgeous girl! I've wanted to start a blog for 3 years. I just wish I had started it sooner! As a new(ish) blogger I think there can also be a bit of initial negativity, as there are bloggers who get a bit put offside, and feel as though you are taking from them. As for haters I like the quote "Haters are fans in denial"
Some valuable lessons! I'm pretty new to blogging (not even a year old) but I can definitely relate to wanting a perfect blog right off the bat. Logically I knew that I wouldn't, but it took me a while to actually realize that people weren't just going to come running and I needed to make an effort. It's really cool to hear that it helped your confidence and preservation though! I struggle with this myself, so it's a positive thing to hear from someone who has gone through it. I'd love to step further out of my comfort zone this year and meet more bloggers! I'm a total newb to this blogging biz, but I'd been wanting to start one for almost 18 months before I took the plunge. It's only now that I'm realising just how much WORK goes into it. Despite having a whole bunch of posts written before I started, it has been a bit of a struggle thinking ahead in terms of creating content. Photography isn't my strongest suit, but it's an area I want to get better at. Seeing everybody else and their perfectly curated photos drives me to improve. Blogging has taught me not to over commit myself. If you can't do 3 posts a week, then don't! I know you promised your readers but they will understand! Its not worth making yourself sick over. Its also helped me overcome some of my social anxiety the more new people i meet at events I've been invited too. Congrats on starting your blog - it sounds like you have so much dedication, which is good to hear. And I'm so glad you feel driven rather than saddened by the fact you aren't "perfect" as so many bloggers appear to be. And yes my supporters definitely outweigh the haters since they're worth so much more to me! Only give up the blog if you truly get no joy from it. I have heard amazing things from the UK community though - they all seem so lovely and helpful! Thank you Jackie. I'm so glad you've met some lovely people thanks to Bloggers United. That was definitely our aim so even if we've only helped one person, we're still a success! I'm so glad to hear you say that Lauren and I definitely feel the same way! I struggled so bad with social anxiety growing up, I really get a shock when I see just how far I've come!